Eat, play, and learn on Labor Day weekend! Summer is coming to a close and kids are going back to school. At Tanaka Farms they are all about celebrating the change of seasons! Come on out on Saturday 9/3 and Sunday 9/4 from 10:00 to 2:00 to enjoy:"Backyard BBQ" plates at our Food Shack - juicy ribs, grilled farm veggies, along with many of "the Shack's" everyday items. ATV rides for our younger guests. Planting station to start your own garden. Free samples of their season's harvest - corn, melons, grilled onions, butternut squash. Free cooking demo by Chef Joni (see below for info). 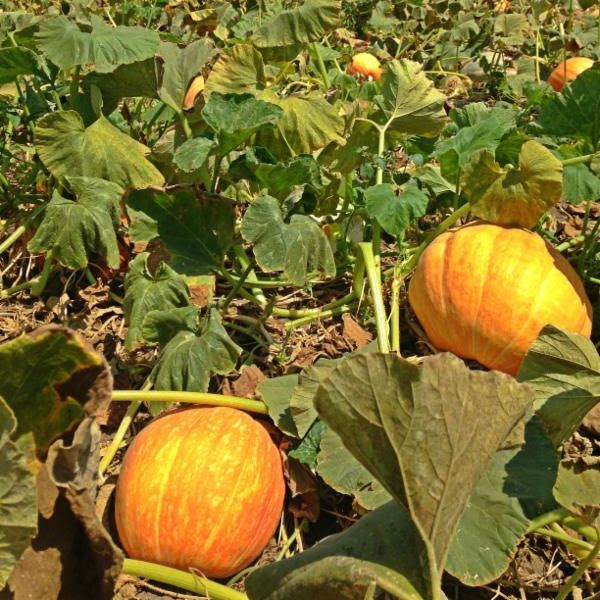 Get a sneak peek into our Pumpkin Patch! FREE admission to the festival. Some activities are priced separately. Yes, Tanaka Farms will still be running Melon Tours and U-Pick Tours this weekend at their scheduled times. If you are a CSA member, look for an email with a special offer for this weekend! 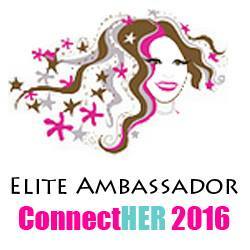 Check the Calendar of Events page for more information about tours. 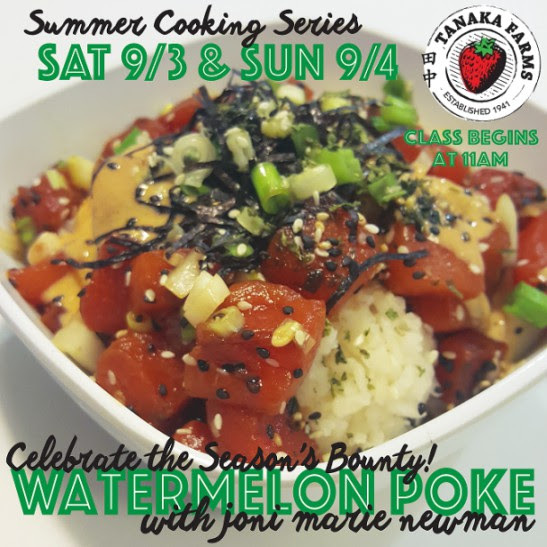 Learn how to make amazing vegan Poke! Come hungry! Click here to learn more about Chef Joni at justthefood.com. 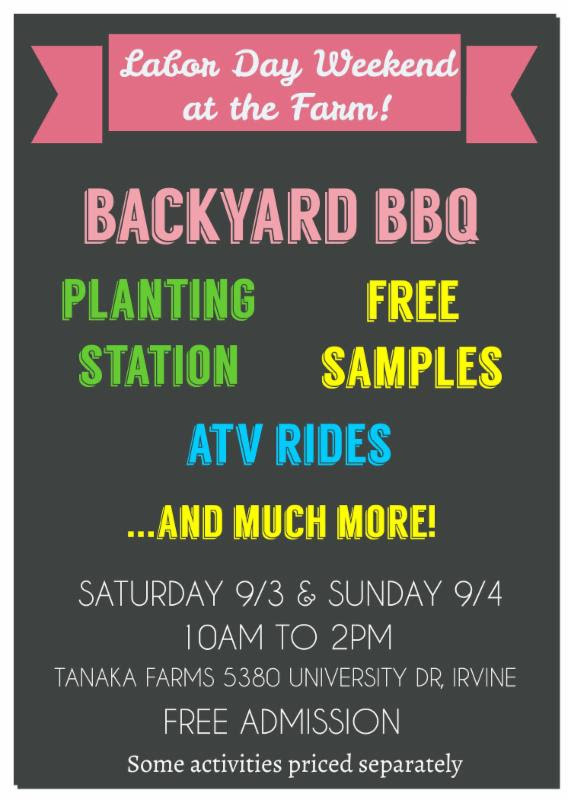 UCCE Master Gardeners of Orange County comes to Tanaka Farms. 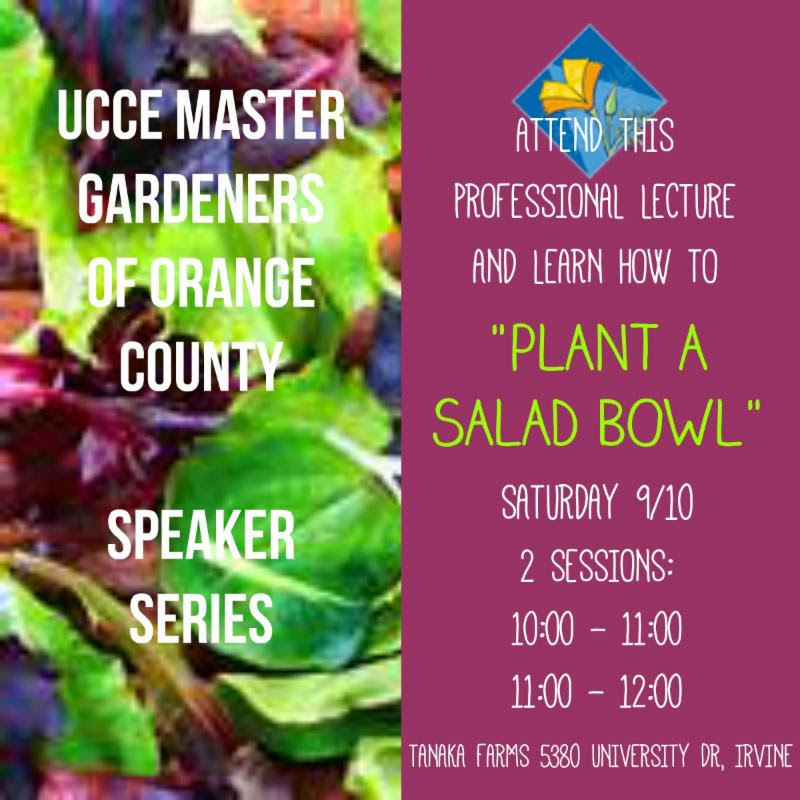 Tanaka Farms, in partnership withMaster Gardeners of Orange County, is pleased to offer the first of our gardening lecture series to be held at our farm! In this workshop, learn how to: "Plant a Salad Bowl" - Creating a leafy green harvest in your own backyard is both healthy and enjoyable! Learn more about Master Gardeners at their website. Find a new friend for life at our Dog Adoption Day! If you love pets as much as we do you won't want to miss their Dog Adoption Event! 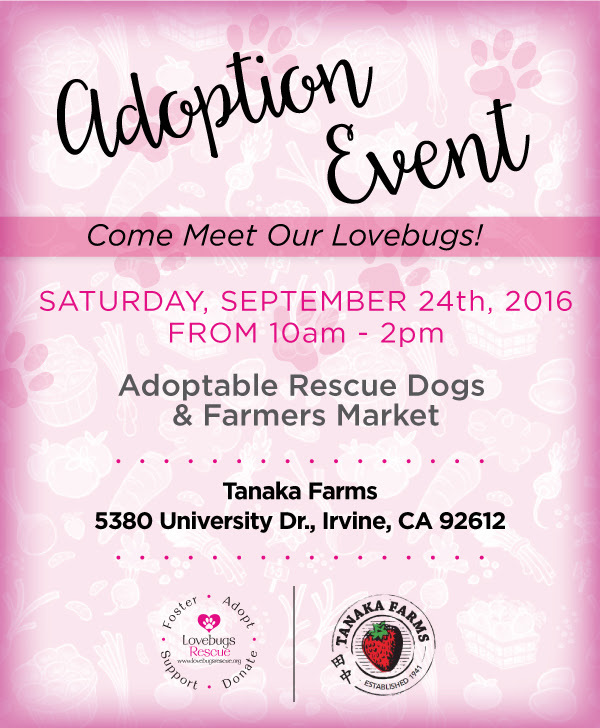 Lovebugs Rescue will be there with some of their sweet adoptables looking for loving homes. Visit Lovebugs' website for photos and information about their mission. They will also have a pet boutique with unique accessories to spoil your pet! Pumpkin Patch Opens on 9/29! In one month, we open the gates to fields of pumpkins in all shapes, sizes, and colors! Yes, our Pumpkin Patch starts soon so get your porch ready for Jack-O-Lanterns. This picture was taken just a week ago so you can imagine the fields turning more orange by the day. Enjoy a wagon ride, petting zoo, and veggie patch, and corn maze daily. On weekends enjoy games, pumpkin cannon, ATV rides, and much more! Tanaka Farms Foodies are already preparing a unique pumpkin season menu too! Visit the Pumpkin Patch page for more information. Costumes always welcome! September 10th: Master Gardeners Lecture - "Plant a Salad Bowl"
Happy Fall Everyone - Have a Farm to Table Fresh Time!